Focus on Goa Chief Minister Manohar Parrikar, instead of harping on Delhi Chief Minister Arvind Kejriwal, former Indian Police Service officer Kiran Bedi told reporters in Goa Sunday.Bedi, who was once Kejriwal's ally in the anti-corruption campaign, is now backing Gujarat Chief Minister and BJP's prime ministerial candidate Narendra Modi. Bedi was addressing reporters Sunday at a workshop on coastal security at the beach resort village of Calangute, 15 km from Goa capital Panaji. After first refusing to comment on Kejriwal, Bedi said: "Why don't you talk about your own Chief Minister Parrikar? People here are saying he is doing a great job. "Bedi also said that there was too5 much spotlight on Kejriwal, and requested the media to highlight the Goa BJP chief minister's achievements too. 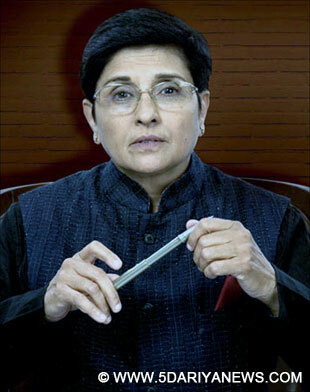 "People I have interacted with here have been speaking well about Parrikar's development," Bedi said.